​ in Southern India led to deadly conflicts between humans and elephants. ​the world’s largest land mammal into the world’s largest cages. ABAC student Austin Morris, Dr. Thomas Grant and D.K. 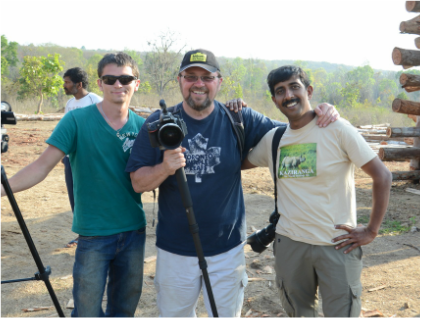 Bhaskar during a video shoot at the capture of a wild elephant. Thomas Grant interviews D.K. Bhaskar. Publications about "Elephants in the Coffee"
The American Bazaar: "How a deadly conflict over coffee with humans in India is forcing elephants into cages." India West: "Is Your Cup of Coffee Killing Elephants? New Documentary Examines Conflict Between Endangered Elephants and Farmers in Southern India." "The Hindu: (India) “A god that became a menace” may be a catchy phrase while talking about elephants in India. Or it might just succinctly put a whole lot of conflicting ideas in front of you"
KCUR online: (Kansas City, MO) "Their film — at times necessarily graphic in its violence — features several of Grant’s students, whose emotions create a point of entry for viewers who might not know anything about the problem at hand." 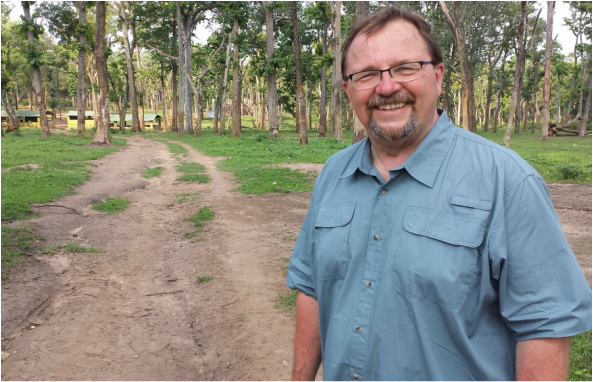 KCBX radio and online (San Luis Obispo, CA): "Most people know that coffee is the world’s most popular beverage, but few realize that farmers in India may have actually given their lives for that morning cuppa Joe." Bangalore Mirror (India): "There is a moment in Elephants in the Coffee when Naveen Cariappa (his family has farmed an area in Coorg for more than three generations) talks about how media, officials and conservationists rush to the site of an elephant death, but remain silent when a coffee plantation worker is killed as a result of conflict with the very same elephants." The New Indian Express: "When you sip a cup of coffee every morning, do you wonder about the coffee estates and how elephants have become inhabitants of these estates?" Grant has won more than 10 national awards for his reporting, including two duPont-Columbia Awards, often referred to as the Pulitzers of broadcasting. He worked 30 years as a journalist in television and newspapers before earning his Ph.D. at the University of Idaho. Grant holds a bachelor’s degree from Washington State University and a master’s degree from the Columbia University Graduate School of Journalism in New York City. He was the Mike Wallace Fellow for Investigative Reporting at the University of Michigan in Ann Arbor in 1997-98. Grant spent much of his journalism career in Spokane, Washington. In 1995, he won the George Polk Award for courage in reporting for a long series of stories about a group of people falsely accused of child abuse. Ultimately, 18 innocent people were released from prison. Grant’s reporting on milk prices earned an Oscar in Agriculture Award from the University of Illinois. His documentary on ethics in sports won a national prize for public service from the Society of Professional Journalists. He also won a national prize for investigative reporting from the Society of Professional Journalists in 2001 for uncovering a secret deal to move taxpayer money into a mall development project. A Fulbright specialist and an International Fellow with the Explorers Club, Bhaskar lectures about cultural conservation and social anthropology, and regularly collaborates with international organizations to develop social documentaries and travel stories. He is an active member of the Society of American Travel Writers (SATW). He has won numerous awards for photography, and his work has been featured in publications such as Lonely Planet, Rolling Stone, BBC, UNESCO and Insight. He is the founder of the Augusta Photography Festival and CLIC Abroad, an organization that leads international student exchanges between India and the United States. Regehr is a Washington State native and a graduate of Eastmont High School in East Wenatchee, Washington. He holds a Bachelor of Arts Degree in Radio and Television News Production from Eastern Washington University. After a short internship with KREM TV in Spokane, Regehr worked for nearly 5 years as a news photographer and chief photographer for KTVB (NBC) in Boise, Idaho. Regehr returned to Spokane and worked as a news photographer for 18 years at KREM (CBS) television. His television career brought him many accolades including two Emmy Awards, dozens of AP, UPI and SPJ awards, and the coveted DuPont-Columbia University Journalism award for his work with reporter Tom Grant. Regehr continues to work with the video camera freelancing for the networks as well as working with local clients. Austin Morris is a native of Ocilla, Georgia, and studied business at Abraham Baldwin Agricultural College. He served as editor and advertising manager of the student newspaper, The Stallion, and earned an associate's degree in 2016. He works for Trade Buddy, a wholesale automobile company, managing its marketing and advertising. 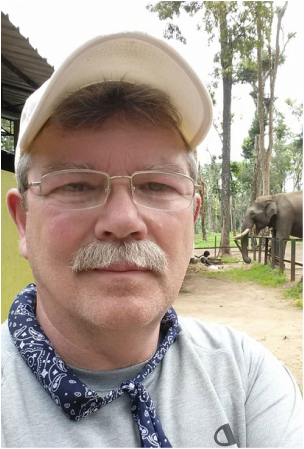 Morris traveled to India to assist with 'Elephants in the Coffee' in 2014 and 2015. Shelby Evans of Fitzgerald, Georgia, graduated from Abraham Baldwin Agricultural College in 2016 with a degree in Writing and Communication. She served as editor of the student newspaper, The Stallion, and was a finalist for the ABAC Alumni Award as the school's top graduate. She traveled to India to assist with the documentary in 2015. Her blog is called Acquiring The Taste.